Great Scott! Behold a genuine time machine! Crank up the Flux Capacitor and head back to the future! Back to the Future movie replica. Features enhanced film accuracy and improved lighting design. Buy this and be the envy of all your collector friends! Remember the 1980s? Return there now! Crank up the old Flux Capacitor and head on back to the future! 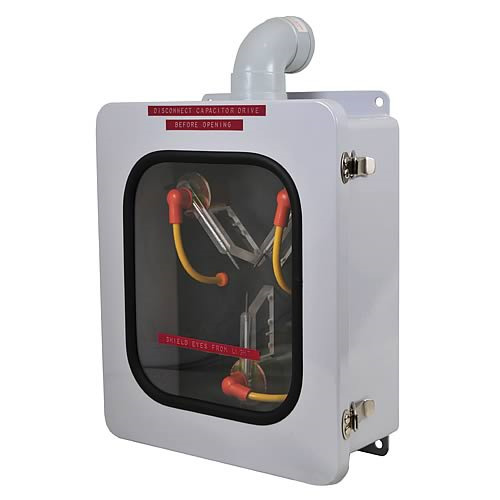 Now you can get your own time machine up and running with this sturdy 16-inch tall x 11-inch wide high-tech electronic metal replica from the immortal 1985 movie Back to the Future. Back by popular demand - and with enhanced film accuracy and improved lighting design - this unlimited edition delivers all the detail of the sold-out previous release. It lights up with the flip of a switch, and this version features an authentic solid light, without the strobe effect. Replicas like this only come along a few times each century, so be sure to grab yours right away! Requires 3x "AA" batteries, not included.